Towards a Unified View of Temperature-compensated 24 h Period in Biological Clock System. 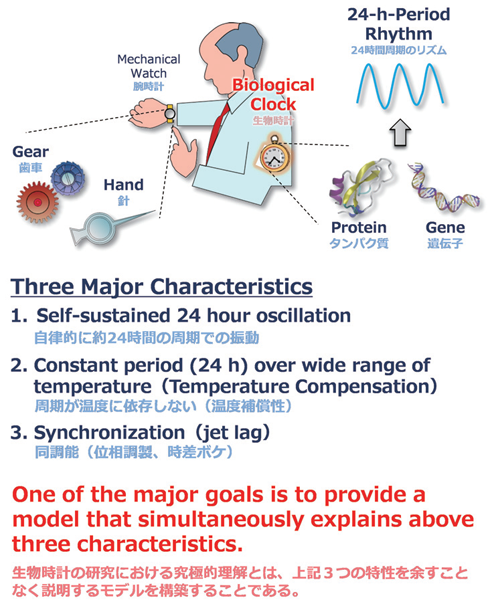 S. Akiyama, “Structural and dynamic aspects of protein clocks: How can they be so slow and stable?” CMLS, 69, 2147-2160 (2012). S. Akiyama, A. Nohara, K. Ito and Y. Maéda, “Assembly and Disassembly Dynamics of the Cyanobacterial Periodosome” Mol. Cell, 29, 703-716 (2008). Y. Murayama , A. Mukaiyama , K. Imai, Y. Onoue, A. Tsunoda, A. Nohara, T. Ishida, Y. Maéda, K. Terauchi, T. Kondo and S. Akiyama, “Tracking and Visualizing the Circadian Ticking of the Cyanobacterial Clock Protein KaiC in Solution” EMBO J., 30, 68-78 (2011). A. Mukaiyama, M. Osako, T. Hikima, T. Kondo and S. Akiyama, “A protocol for preparing nucleotide-free KaiC monomer” BIOPHYSICS, 11, 79-84 (2015).